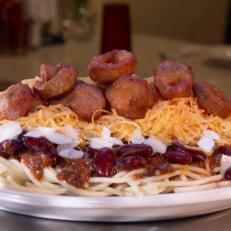 The chili at this Cincinnati institution can be served plain, 3-way, 4-way, 5-way or 6-way. Learning the lingo didn't take long for Guy Fieri. He ordered the 6-way, which includes everything: chili, spaghetti, beans, onions, cheese and fried jalapeno caps.